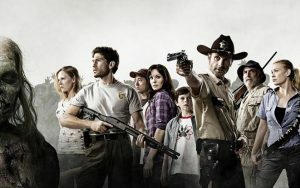 The pilot episode of the Zombie Epic tv series, “The Walking Dead” was the biggest premiere and highest rated broadcast in AMC’s history. Kudos to Robert Kirkman and Tony Moore for creating this story ten years ago. And leave it to Frank Darabont to tell the story on film, and all that is right in the zombie apocalyptic world rests easy. It was only a matter of time before AMC would add another season and that time is now. AMC has ordered a 2nd season with 13 episodes. No word yet on what will the story arc be or where are survivors will be headed in the 2nd season. Darabont said right before the pilot episode aired, that he has only mapped out the 1st season which is only six episodes long. Two have already aired. When they get the go ahead for the 2nd season, they will re-visit Kirkman’s comic and evaluate and start to adapt and make the stories. Which of course is now. I am so happy for everyone involved. Rest assured if I visit Atlanta in the next several months I am going to try like hell to get on set and become a walk on zombie extra. This entry was posted on Monday, November 8th, 2010 at 8:05 pm	and is filed under News. You can follow any responses to this entry through the RSS 2.0 feed. You can skip to the end and leave a response. Pinging is currently not allowed. « The Goon – Animated Feature Movie Trailer!